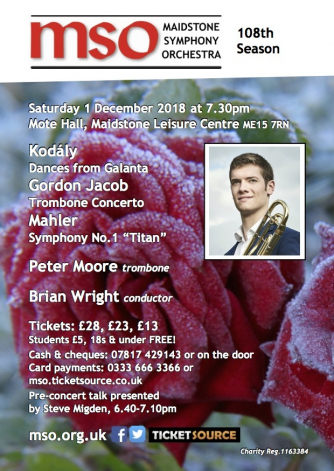 Kodály’s very ethnic and Hungarian-sounding Dances from Galánta set the scene for Gordon Jacob’s highly entertaining Trombone Concerto. Ten years on from playing it to become the youngest BBC Young Musician, Peter Moore is now co-principal trombonist of the LSO. Mahler’s vision changed the concept of the symphony. For him it was not just about music, but something “world encompassing”. In his 1st Symphony there’s vast power from a huge orchestra, contrasted with a song-like charm.